Sub: Rate of Dearness Allowance applicable w.e.f. from 01.07.2018 to Railway employees continuing to draw their pay in the pre-revised pay scale/ grade pay as per 6th Central Pay Commission. 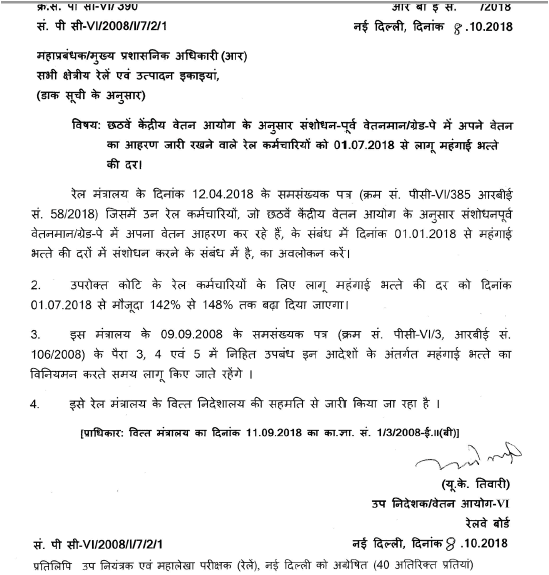 Please refer to this Ministry’s letter of even number dated 12.4.2018 (S.No. 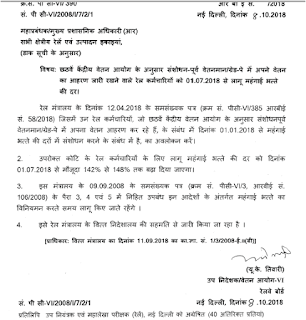 PC-VI/385, RBE No.58/2018) revising the rates of Dearness Allowance w.e.f. 01.01.2018 in respect of railway employees continuing to draw their pay in the pre-revised pay scale/ grade pay as per 6th Central Pay Commission. 2. The rate of DA admissible to railway employees of above category shall be enhanced from the existing rate of 142% to 148% w.e.f 01.07.2018. 3. The provisions contained in Paras 3,4 & 5 of this Ministry’s letter of even number dated 09.09.2008 (S.No. PC-VI/3, RBE No.106/2008) shall continue to be applicable while regulating Dearness Allowance under these orders.